My sandwich bread recipe can be made ahead and frozen as dough or as baked bread. Bread is such a staple in most family meal plans that there should always be a loaf in the freezer, and if that can be a homemade loaf without all the preservatives found in store bough bread today all the better. This bread is great for frozen sandwiches, super quick lunches even on your busiest days. 1/2 cup powdered milk, or substitute milk for up to half the water. Combine two cups of flour, sugar, salt, un-dissolved yeast and if your using it the powdered milk. Use water OR regular milk that is warm to the touch and add to dry ingredients. Beat well, I usually use my Kitchen Aid stand mixer for this part. Mix for about two minutes to get the gluten started, then add in more flour one cup at a time. After four cups of flour I turn the dough out to a floored surface, usually my kitchen table, and knead by hand. My mixer starts to strain if I try to make this double batch with all the flour in it. After kneading, then let rest for 10 minutes. Punch down the dough and cut in in half. I use a knife to cut the dough. Shape into loaves and let rise until doubled about 45 minutes. Bake at 400 Fahrenheit for 25-30 minutes. Immediately remove from the pan and let cool. How to freeze bread dough after shaping but before rising. 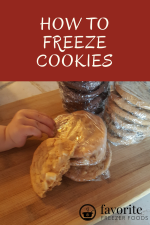 Freeze for 2-3 months. How to freeze baked bread after it has cooled completely. Slice before freezing if desired. Wrap well in freezer quality materials. I use a plastic freezer bag or plastic wrap and tin foil. 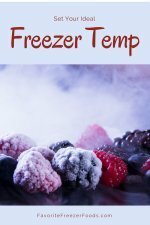 Freeze for up to 6 months if well wrapped. Return from Sandwich Bread Recipe to the homepage of Favorite Freezer Foods.